Kat discovered a neat little Forest Service campground with all the conveniences just south of New Bern (say “Newburn”) NC. New Bern is big enough without being Big. It has a Wal-Mart, a Tractor Supply (for your propane needs), several Laundromats, and two Bojangles biscuit and chicken eateries. The park is known by the locals as Flanners Beach, and that’s how you’ll find it via the Google. 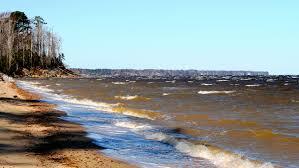 There is a small beach with brownish sand overlooking the vast Neuse Basin, which is actually an Atlantic coast brackish bay. The weather was cool, the biting bugs still dormant, wih the dogwoods in peak bloom, as were the redbuds. Once again we are chasing Ol’ Man Winter going up north. But wait, a few tablespoons of precious backfin crabmeat remain in the dish! What to do with this treasure? Why, let’s make an omelette tomorrow morning. We’ll serve it with skillet French bread toast and orange juice, freshly squeezed from one of those Wal-Mart cans. Ah, how can it get better than this! That boiled crab is looking pretty naked. Here in the land of pleasant living, we steam our blue crabs with beer and plenty of old bay seasoning! 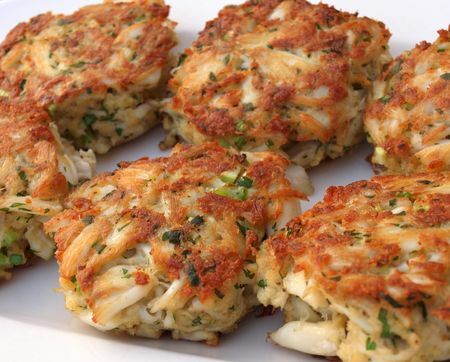 And no self-respecting Maryland crab cake would have that fancy mustard and panko bread crumbs! 😉 $2 a crab is a steal! Jumbos here are $60 + a dozen. We learned crab boiling in south Louisiana where the beer goes into the humans and the seasoning is salt and Zatarain’s liquid … nobody wants peppery fingers. Inasmuch as the crabs were sourced in NC, maybe they weren’t Maryland cakes. The recipe claims they are, and I can assure you they were quite good.